In a previous post I tried to make clear why debates are such a bad way to improve scientific understanding. In the comments Mark Ryan pointed to a great article by John Ziman: "Are debatable scientific questions debatable?" In the article, political debates are compared to scientific disputes. Ziman seem to agree with me: a short summary of his position could be that the only similarity between political debates and scientific disputes is that they are both public. The main difference is that while debates are typically verbal, scientific disputes are resolved in the scientific literature. That makes a large difference. In the scientific literature the ideas have to be and can be presented in all their gory details. Detail that allows one so see its errors or improve upon the idea. A written dialogue is also slow, which helps to check details and to rethink ones position multiple times before answering. In the article a distinction is made between political debates and scientific disputes. * The proceedings are adversarial, in that each ‘party’ endeavours not only to make their own case but also to negate the case of their opponents, even to the extent of attacking their credibility as expert advocates or cross-examining them severely on disputable points. A debate is about winning and convincing, it is not about improving our understanding of reality, of the problem at hand, not even of the position of the other party. As it is a one off event, presenting misinformation is an effective strategy, especially if you have no reputation to lose, like the climate pseudo-sketpics. Another effective debating strategy if you only want to win is a Gish Gallop, after the strategy of the creationist Duane Gish, to spew such a gallop of misinformation, that the other side would not have enough time to correct all the falsehoods. The rules of the game are very different in science. "Scientific disputation ... typically involves sequences of written arguments and counter-arguments in the official scientific 'literature', rather than oral exchanges in a public forum." Scientists naturally do talk with each other a lot, but what counts is the literature. There are presentations at conferences and workshops, fitting to scientific presentations not being that important "a remarkably low level of verbal fluency is acceptable. ... The conventional presumption, emphasized by stock courtesies from the chair, is that the theme of the paper [i.e. presentation] is worth of serious attention, even if, at first hearing, it seems incomprehensible, wildly speculative, inconsistent, totally boring or otherwise unconvincing or uninteresting!" This statement is funny because it is so true. Not uncommonly you have to make quite an effort to understand the speaker and often a talk is mainly useful as an announcement of a new article. Scientific papers ... [do not] avoid controversial statements. On the contrary, one of the norms of science is that a would-be contribution to knowledge must always be 'original'. I am not sure if I fully agree with this. While scientific papers do not avoid controversy, they also do not aim for it. Papers should be original. Original and controversial are different. You can have a new way to compute something already known, you could analyze a new dataset about which no one had a preexisting opinion, etc. Ideally, [innovative ideas] are presented as if they were already part of the (thus newly-achieved) consensus, in a form that is so unquestionable that it can be treated as camera-ready copy for a new chapter in the next generation of text-books! The only scientific dispute in my surrounding that is not related to the political climate debate, is whether station measurements contain platform-like pairs of break inhomogeneities of short duration. More precisely, whether this is more common as one would expect from random breaks. That this became a dispute was because a decision with a deadline had to be made whether to include them in our HOME validation dataset for homogenization methods. Doing both was unfortunately no option because of man power. The need for a decision, like in politics, did not allow us to withhold opinion until enough evidence was gathered. Fortunately, it was a friendly dispute as no one expects these platforms to be too important. The other two disputes I have experienced, long memory in temperature series and naturally the so-called hiatus, I would view as intrusions of the political debate into science. Another ritual is that "every paper starts with a very conventional 'survey of the field', including a lengthy bibliography that cites all the usual suspects. ... It can be interpreted functionally as a rhetorical device designed to show that the author is so completely at home in the field that their novel ideas are worthy of attention." It also helps the peer reviewers to judge the novelty of the work and avoids double work by forcing the researcher to be up to date. Its main role for scientific progress is that it aids think neutrally, because it forces the author to write about the work of others in an objective way. "Every author is well aware that one of the reviewers may support another side in such a controversy and is likely to turn down a paper that does not present fairly the case of that side." If that is the only peeve, the reviewer will more likely ask for a revision, rather than immediately request rejection. The questions also have a different nature. A debate, in a formal sense, is normally about the acceptability of a specific proposition, but scientific controversies are seldom that simple. ... In reality, scientific progress does not follow Popper's recipe of successive theoretical conjectures being winnowed away by empirical refutations. As other philosophers have pointed out, there are always just too many other untested assumptions that might be the cause of the apparent disconfirmation. While I do not think that Karl Popper was that naive, it is clearly true that if a discrepancy is seen in science, it is not clear in advance where the problem lies. Finding that is the largest part of solving the problem. * The discussion does not close with a formal decision or verdict. Conventional 'debating' practises just do not fit into the evolution of scientific knowledge in its traditional academic mode. In effect, 'debatable' scientific issues are never actually 'debated'. One must therefor seriously ask whether much of value can be achieved by a formal procedure designed to bring scientists together for just such an activity. All the more so for bringing scientists and anti-scientists together. It will certainly not help scientific progress. I fail to see how it would help in communicating our current understanding to the public. A documentary seems much better suited for that. John Ziman: "Are debatable scientific questions debatable?" The Climate Change National Forum now has a section called The Fact Checker. In it they will post the nonsense of pseudo-skeptics and they promise that the CCNF scientists will respond to it. I am glad not to be a CCNF scientist, having to jump up, drop everything I am working on, get myself into the topic and quickly write a response. Until that time, the nonsense is spread undisputed. And that happens every time the CCNF journalist think some pseudo-skeptical article is interesting. Poor scientists. These "Fact Checker" articles have the highest prominence on the CCNF homepage, they are the first thing people will see and click on and are above the articles by CCNF scientists. NOTE TO READER: This is the fact checker section, where the CCNF journalist impartially posts up outside material (the good, the bad, and the ugly), and the scientists fact check or comment on that material. It has come to my attention that some readers don’t understand the function and purpose of this fact checker section. I have received some criticism that, by posting up an article for fact checking and commentary by the CCNF Scientist Community, I am somehow giving credence to the content being posted. Nothing could be further from the truth. Naturally, you give credence to the posted content. Not only will it take time until the scientists can write their response and possibly with mistakes and only responding to parts of the story because of the haste. The article above the line automatically has more credibility as the response below the line. Simply by virtue of being above the line. Until the scientists have responded the articles go undisputed. Without explaining why an idea is wrong, the idea will stick. Even as a scientist, I try to read WUWT and Co. as little as possible, because after some time you often do not know the source of an idea anymore and may falsely assume the source was reliable. That is why I prefer reading HotWhopper to hear what happens at WUWT. As acting journalist, I am trying to provide a sampling of the coverage that I am finding in the greater media. You won’t like all material that is posted. I guarantee that. Heck, I don’t like it. But it is not my role, as acting journalist, to state what is credible and what is not in this Socratic forum of scientists. Not at this early stage at least. That is for the scientists in the Scientists’ Comment Thread under each post. The task of the journalist in this section is to post up the good, the bad, and the ugly — whatever is out there in the online space — in a strictly impartial manner. And I was so naive to think that the role of an acting journalist was to help the reader interpret the news. I guess we can just remove journalists from the equation completely and read random bit of news, mostly nonsense, sometimes accidentally valuable. It is probably good for the click-rates, but I personally prefer quality journalism. One of these "Fact checking" treasures has the "title": "YAHOO NEWS article “Global Cooling — The REAL Inconvenient Truth: Part 1″: Climate is cooling and will likely continue cooling for 20 years, sunspot cycles the “real culprit” of climate change, and new evidence of data manipulation by scientists; the world is cooling, bank on it." And started with snow in Egypt. In the comments written one day later the scientists explain that while the suns intensity has dropped since the beginning of the satellite record in 1979, the temperature has increased. Many other mistakes of the Yahoo post that is reposted fully, such as the camel in the Egyptian snow, are not commented on. An older treasure has the "title": "Dr. Garth Paltridge on JudithCurry.com: Reluctance of IPCC and others to reduce confidence levels in light of hiatus and misunderstood climate mechanisms shows a lack of scientific skepticism." It could be a stupid WUWT post pretending that global warming has stopped because the surface temperatures have not grown as fast as before, fully ignoring that the climate system as a whole keeps on warming and that only more of the warming went into the ocean rather than the atmosphere during the last decade. What makes this CCNF post even worse is that Judith Curry is defending it. Thus we have a confident wrong article above the line and little bickering scientists below the line. Great Fact Checking. That is science communication. My suggestion would be to create a mailing list with the CCNF scientists. That way the journalist can propose articles for the Fact Checking section. This would allow CCNF to write articles where the science is presented above the line and immediately with the nonsense. For the scientists involved this is also much nicer as they will have some more time to prepare a quality reaction. [UPDATE. The problem seems to be solved. @VariabilityBlog @ClimateofGavin Yes, fact checking needs 2 b "above the fold." Chatted w/ #CCNF scientists. Changed system. Stay tuned.
] [UPDATE. This is how the CCNF now does the Fact Checking. Looks like a clear improvement to me. If the "Fact checker" stays this way, I would suggest all scientists to stop participating in CCNF. Let it succumb to another WUWT or Climate Etc. There are a lot of such homepages already; one more won't hurt. That is better as a homepage that has credibility due to the participation of scientists, but that is actually helping spread misinformation. "Michael, I know your heart is in the right place but posting this piece really damages the credibility of CCNF. There is no place for the "It's not happening" argument. ... You have just elevated Dr. Paltridge to the status of the other experts who write here. You also run the risk of deterring real experts from future posts because they do not wish to be associated with this National Enquirer-type nonsense. Keep the discussion where it belongs. ... Michael Quirke Please do a search for "Familiarity Backfire Effect" and you will see why this post is not helpful." "Also, I’d be [in] favor of setting a higher bar for articles to be posted in that section. Most scientists are growing tired of the same old “global warming stopped” type memes and have no interest and no time to engage in a game of whack-a-mole. Plus there are excellent myth-busting websites out there already. If there’s an intelligent argument brought forward that shines a new light on something, now that’s different. Bring it on!" I agree with Bart that the first impression of the CCNF forum is visually dominated by sometimes-bizarre and inflammatory posts that are not even remotely credible, and that this detracts from the quality of the forum. Will post up less of the inflammatory and complete B.S. for a while. Don’t want it to become whack a mole or lose the scientists’ participation. That being said, it is important to show readers what “the mole” looks like. But I have the feeling, he does not really understand why. "Less of the inflammatory and complete B.S. for a while" sounds more like pacifying of the flaring protests than like a long-term solution. [UPDATE. Judith Curry at Climate Etc. now also wrote about the Fact Checker and quoted this post at length. Please find my comment at Climate Etc. (with added tweets) below. Thanks for the plug, even if it is a bit late, because the problem is solved by now. I was complaining about the format of the Fact Checker at CCNF. They were more positive about my input and have now changed the system. The scientists are now responding above the line and are not demoted to responding below the line in the comments. Comments which many people do not read. Otherwise I am quite happy with the CCNF. It is a forum with some science that can lead people back to reality, people that would most likely never visit RealClimate and Co. For the same reason I like your blog, you cite from the scientific literature and I have some hope that this lets people see the difference in quality of argumentation between WUWT and the literature. My comment about 30 to 1 was a response to Mann calling for balance.
.@MichaelEMann @ClimateChangeNF For balance, for every @curryja you would need 30 from mainstream.There are not so many blogging scientists. I was only pointing out that that would be difficult. The fraction of dissenters with blogs is way higher as the fraction of mainstream scientists with blogs. That creates an imbalance that CCNF cannot solve. That is theoretically true for the scientific literature. I am sure you understand that this is not true for blog-science. Isn't that why so many dissenters are blogging? In practice it will likely take more than one Galileo or study. Also the refutation of classical mechanics by quantum mechanics and relativity did not change many thinks we already understood at the time. It allowed us to study new things and ask new questions. That was the revolution. Climatology is a mature field and new finding will more likely change the complete picture only little. The most uncertainty is in the impacts, improving our understanding there will have to be done one impact at a time. And more likely, one aspect of an impact at a time. I have the feeling the Skeptical Science understands debunking climate myths at lot better; see their Myth Debunking One-Pager. 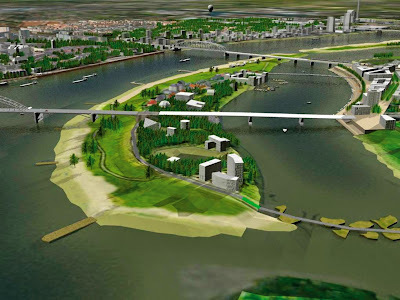 The river Waal at Nijmegen, The Netherlands. The original river is to the left, which was a bottleneck and extra dangerous due to the curve. This problem has been resolved by a bypass (right), which has made part of the old dike into an island. In this way the river got more space and flood risks are reduced. The New York Times Magazine has a beautiful article on a Dutch water manager, Henk Ovink. He enrolled with Shaun Donovan, the United States Secretary of Housing and Urban Development, serving in the cabinet of President Barack Obama to make the USA fit for the next Sandy. The Dutch approach to water management is very different and looks for inexpensive regional collaborative solutions. Whereas the Americans prefer expensive local isolated solutions, because solutions that would help everyone would be "socialist". I do not know about socialism, but the American solution sure reminds one of the relative suffering mechanism, I recently proposed to understand the climate "debate" in the post: "Do climate dissenters like climate change?" Relative suffering is an evolutionary mechanism where you do not optimize your own absolute fitness, but rather how well you and your kin are doing relative to outsiders. It can be an evolutionary stable strategy suffer more yourself, as long as others suffer more. The irrational response to climate change of some Americans is really unbelievable. Is there a smiley for someone shacking his head? I wonder whether Carbonell realises that the farmer will naturally be compensated for his "socialist" behaviour. In that case the behaviour would be economically rational as it would maximise wealth. Sounds like being a good capitalist is socialist in the USA.